A panic attack is a sudden surge of overwhelming anxiety and fear. Your heart pounds and you can’t breathe. You may even feel like you’re dying or going crazy. Left untreated, panic attacks can lead to panic disorder and other problems. They may even cause you to withdraw from normal activities. But panic attacks can be cured and the sooner you seek help, the better. With treatment, you can reduce or eliminate the symptoms of panic and regain control of your life. What separates normal fears from panic attacks? Fear based stress is a common experience that occurs when we face something unknown or something that makes us feel uncomfortable. It’s part of our nervous systems response to a real or possible threat and prepares us to fight or flee. Panic is an intense wave of fear characterized by its unexpectedness and debilitating, immobilizing intensity. Panic attacks often strike out of the blue, without any warning. There may be no clear reason for the attack. They may even occur when you're relaxed or asleep. 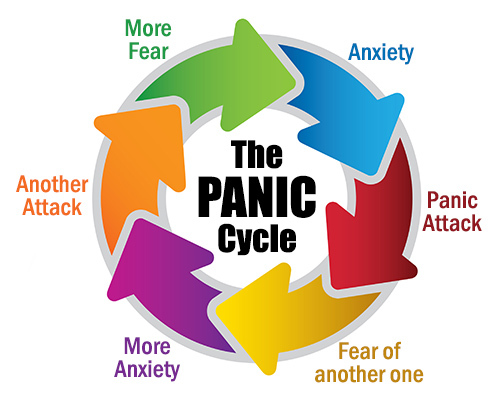 A panic attack may be a one-time occurrence, but many people experience repeat episodes. Recurrent panic attacks are often triggered by a specific situation, such as crossing a bridge or speaking in public—especially if that situation has caused a panic attack before. Usually, the panic-inducing situation is one in which you feel endangered and unable to escape. You may experience one or more panic attacks, yet be otherwise perfectly happy and healthy. Or your panic attacks may occur as part of another disorder, such as panic disorder, social phobia, or depression. Regardless of the cause, panic attacks are treatable. There are coping strategies you can use to deal with the symptoms and there are also effective treatments. Panic attacks often strike when you’re away from home, but they can happen anywhere and at any time. You may have one while you’re in a store shopping, walking down the street, driving in your car, or sitting on the couch at home. The signs and symptoms of a panic attack develop abruptly and usually last anything from 30 seconds to 10 minutes. 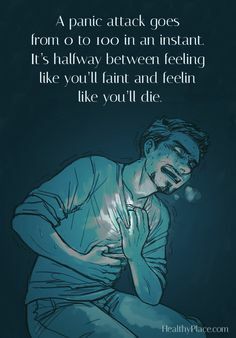 Is it a heart attack or a panic attack? Most of the symptoms of a panic attack are physical, and many times these symptoms are so severe that people think they’re having a heart attack. In fact, many people suffering from panic attacks make repeated trips to the doctor or the emergency room in an attempt to get treatment for what they believe is a life-threatening medical problem. While it’s important to rule out possible medical causes of symptoms such as chest pain, heart palpitations, or difficulty breathing, it’s often panic that is overlooked as a potential cause—not the other way around. 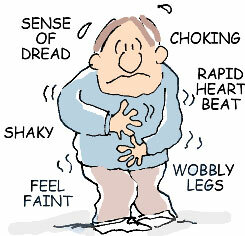 Many people experience panic attacks without further episodes or complications. There is little reason to worry if you’ve had just one or two panic attacks. However, some people who’ve experienced panic attacks go on to develop panic disorder. Panic disorder is characterized by repeated panic attacks, combined with major changes in behavior or persistent anxiety over having further attacks. Anticipatory anxiety – Instead of feeling relaxed and like yourself in between panic attacks, you feel anxious and tense. This anxiety stems from a fear of having future panic attacks. This “fear of fear” is present most of the time, and can be extremely disabling. Agoraphobia was traditionally thought to involve a fear of public places and open spaces. However, it is now believed that agoraphobia develops as a complication of panic attacks. With agoraphobia, you’re afraid of having a panic attack in a situation where escape would be difficult or embarrassing. You may also be afraid of having a panic attack where you wouldn’t be able to get help. Because of these fears, you start avoiding more and more situations. For example, you might begin to avoid crowded places such as shopping malls or sports arenas. You might also avoid cars, airplanes, subways, and other forms of travel. In more severe cases, you might only feel safe at home. Although agoraphobia can develop at any point, it usually appears within a year of your first recurrent panic attacks. Although the exact causes of panic attacks and panic disorder are unclear, the tendency to have panic attacks runs in families. The genetic disposition is probably linked to the serotonin system. There also appears to be a connection with major life transitions such as graduating from college and entering the workplace, getting married, and having a baby. Severe stress, such as the death of a loved one, divorce, or job loss can also trigger a panic attack. 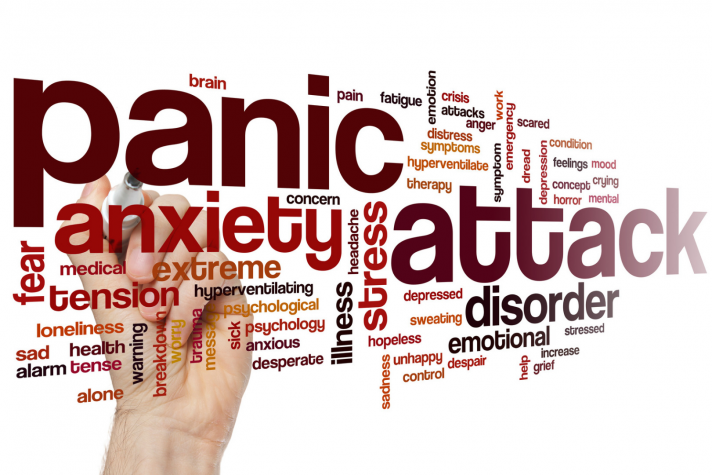 Panic attacks and panic disorder are treatable conditions. They can usually be treated successfully with medication and/or a series of therapy sessions. There are also some self-help strategies you can employ. Panic disorder is a chemical imbalance of the serotonin system in your brain. Medication is most effective when combined with other treatments, such as therapy and lifestyle changes, that address the underlying causes of panic disorder. Antidepressants. It takes several weeks before they begin to work, so you have to take them continuously, not just during a panic attack. You also have to continue the treatment for at least a year, so that your brain gets time to repair itself. The antidepressants that work well for panic disorder are the SSRI’s (selective serotonin re-uptake inhibitors), usually in stronger dosages than those used to treat depression. Benzodiazepines. These are anti-anxiety drugs that act very quickly (usually within 30 minutes to an hour). Taking them during a panic attack provides rapid relief of symptoms. However, benzodiazepines are highly addictive and have serious withdrawal symptoms, so they should only be used short-term, not for longer than two weeks continuously. They are often used at the initiation of antidepressant therapy. Cognitive behavioral therapy is generally viewed as the most effective form of treatment for panic attacks, panic disorder, and agoraphobia. Cognitive behavioral therapy focuses on the thinking patterns and behaviors that are sustaining or triggering the panic attacks. It helps you look at your fears in a more realistic light. For example, if you had a panic attack while driving, what is the worst thing that would really happen? While you might have to pull over to the side of the road, you are not likely to crash your car or have a heart attack. Once you learn that nothing truly disastrous is going to happen, the experience of panic becomes less terrifying. In exposure therapy for panic disorder, you are exposed to the physical sensations of panic in a safe and controlled environment, giving you the opportunity to learn healthier ways of coping. You may be asked to hyperventilate, shake your head from side to side, or hold your breath. These different exercises cause sensations similar to the symptoms of panic. With each exposure, you become less afraid of these internal bodily sensations and feel a greater sense of control over your panic. If you have agoraphobia, exposure to the situations you fear and avoid is also included in treatment. As in exposure therapy for specific phobias, you face the feared situation until the panic begins to go away. Through this experience, you learn that the situation isn’t harmful and that you have control over your emotions. Learn about panic and anxiety. Simply knowing more about panic can go a long way towards relieving your distress. So read up on anxiety, panic disorder, and the fight-or-flight response experienced during a panic attack. You’ll learn that the sensations and feelings you have when you panic are normal and that you aren’t going crazy. Avoid smoking, alcohol, and caffeine. These can all provoke panic attacks in people who are susceptible. As a result, it’s wise to avoid alcohol, cigarettes, coffee, and other caffeinated beverages.. Also be careful with medications that contain stimulants, such as diet pills and non-drowsy cold medications. Learn how to control your breathing. Hyperventilation brings on many sensations (such as lightheadedness and tightness of the chest) that occur during a panic attack. Deep breathing, on the other hand, can relieve the symptoms of panic. By learning to control your breathing, you develop a coping skill that you can use to calm yourself down when you begin to feel anxious. If you know how to control your breathing, you are also less likely to create the very sensations that you are afraid of. Practice relaxation techniques. When practiced regularly, activities such as yoga, meditation, and progressive muscle relaxation strengthen the body’s relaxation response—the opposite of the stress response involved in anxiety and panic. And not only do these relaxation practices promote relaxation, but they also increase feelings of joy and equanimity. So make time for them in your daily routine. Connect face-to-face with family and friends. Anxiety thrives when you feel isolated so regularly reach out to people who care about you. If you feel that you don’t have anyone to turn to, explore ways to meet new people and build supportive friendships. Exercise regularly. Exercise is a natural anxiety reliever so try to get moving for at least 30 minutes on most days (three 10-minute sessions is just as good). Rhythmic aerobic exercise that requires moving both your arms and legs—like walking, running, swimming, or dancing—can be especially effective. Get enough restful sleep. Insufficient or poor quality sleep can make anxiety worse, so try to get seven to nine hours of quality sleep a night. If sleeping well is a problem for you, these tips to getting a good night’s sleep can help. Professor Paul Salkovskis, Professor of Clinical Psychology and Applied Science at the University of Bath, says it's important not to let your fear of panic attacks control you. "Panic attacks always pass and the symptoms are not a sign of anything harmful happening," he says. "Tell yourself that the symptoms you're experiencing are caused by anxiety." He says don't look for distractions. "Ride out the attack. Try to keep doing things. If possible, don't leave the situation until the anxiety has subsided." "Confront your fear. If you don't run away from it, you're giving yourself a chance to discover that nothing's going to happen." As the anxiety begins to pass, start to focus on your surroundings and continue to do what you were doing before. "If you’re having a short, sudden panic attack, it can be helpful to have someone with you, reassuring you that it will pass and the symptoms are nothing to worry about," says Professor Salkovskis. Breathe in as slowly, deeply and gently as you can, through your nose. Breathe out slowly, deeply and gently through your mouth. Some people find it helpful to count steadily from one to five on each in-breath and each out-breath. Close your eyes and focus on your breathing.